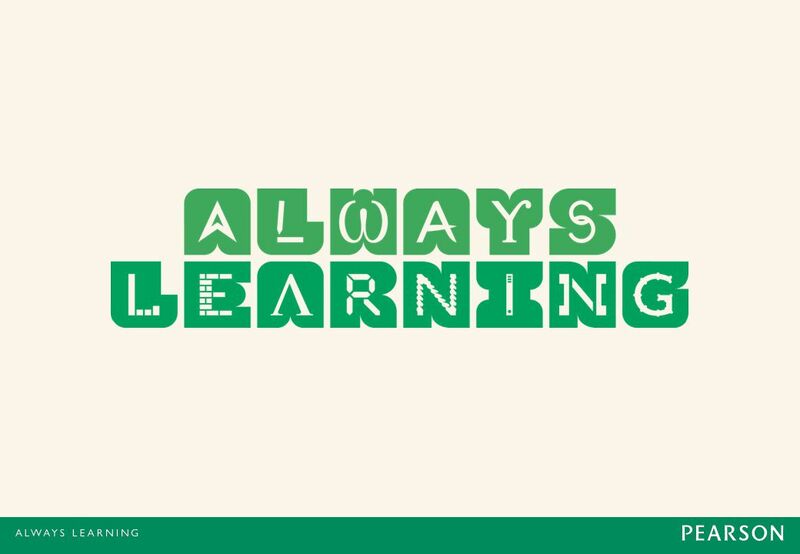 3 Learning Outcomes Follow this Learning Outline as you read and study this chapter. 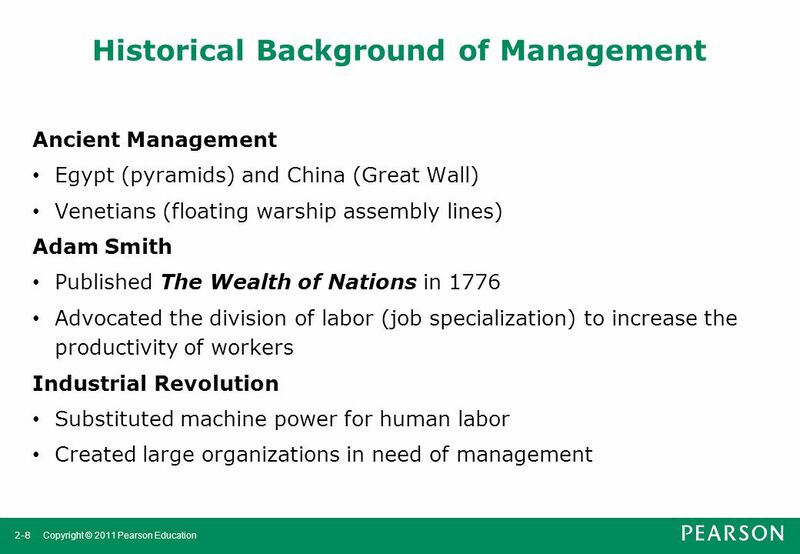 2.1 Historical Background Of Management Explain why studying management history is important. 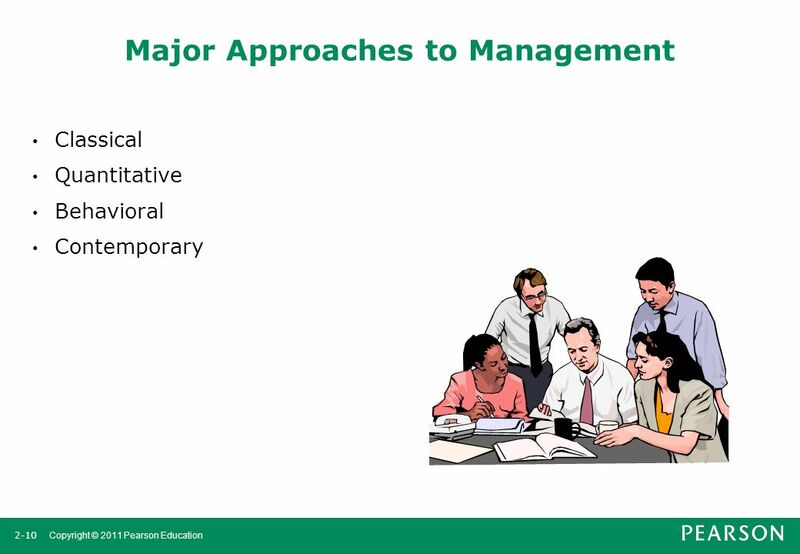 Describe some early evidences of management practice. 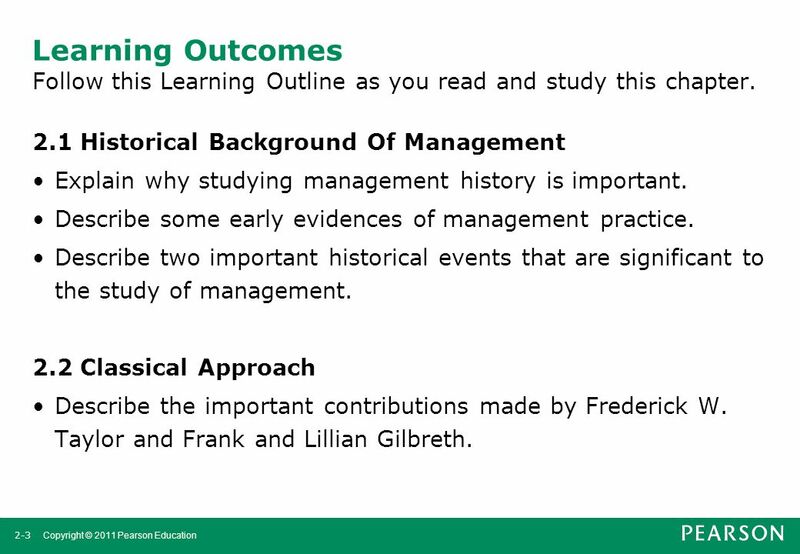 Describe two important historical events that are significant to the study of management. 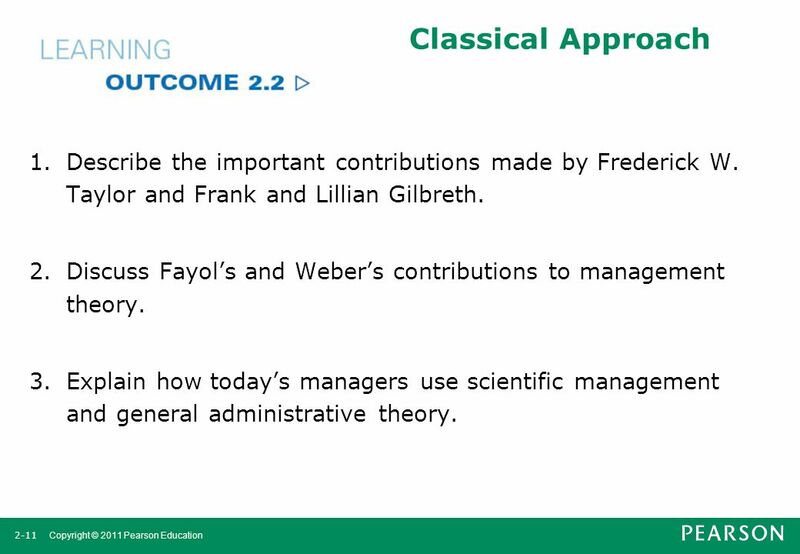 2.2 Classical Approach Describe the important contributions made by Frederick W. Taylor and Frank and Lillian Gilbreth. 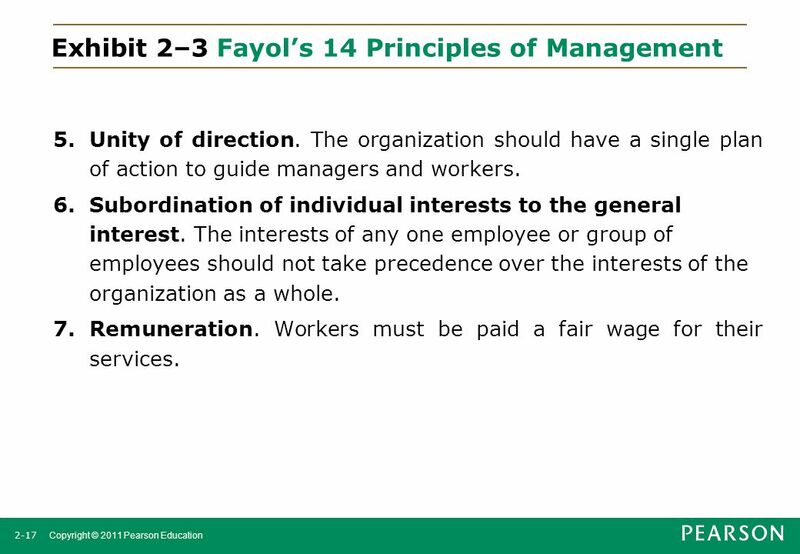 Discuss Fayol’s and Weber’s contributions to management theory. 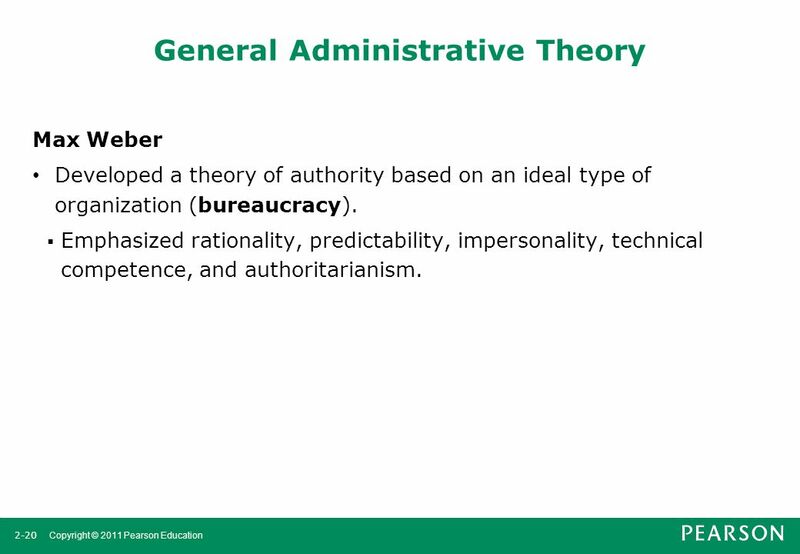 Explain how today’s managers use scientific management and general administrative theory. 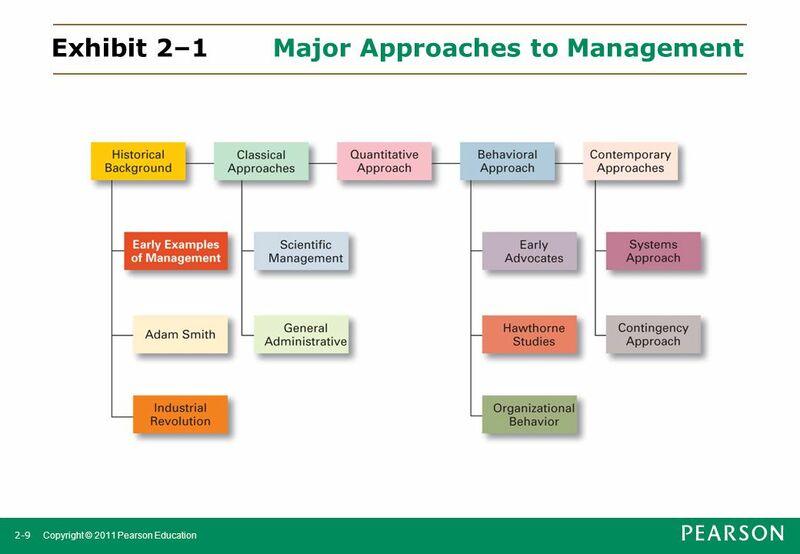 2.3 Quantitative Approach Explain what the quantitative approach has contributed to the field of management. Describe total quality management. 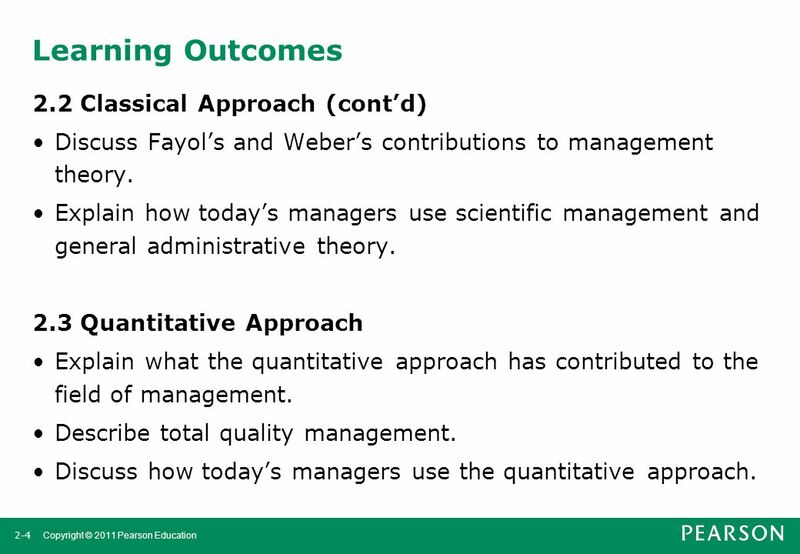 Discuss how today’s managers use the quantitative approach. 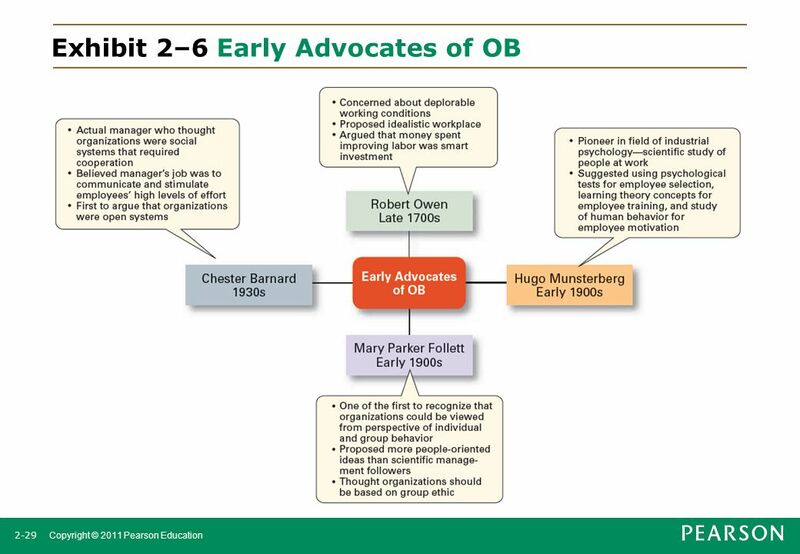 Describe the contributions of the early advocates of OB. 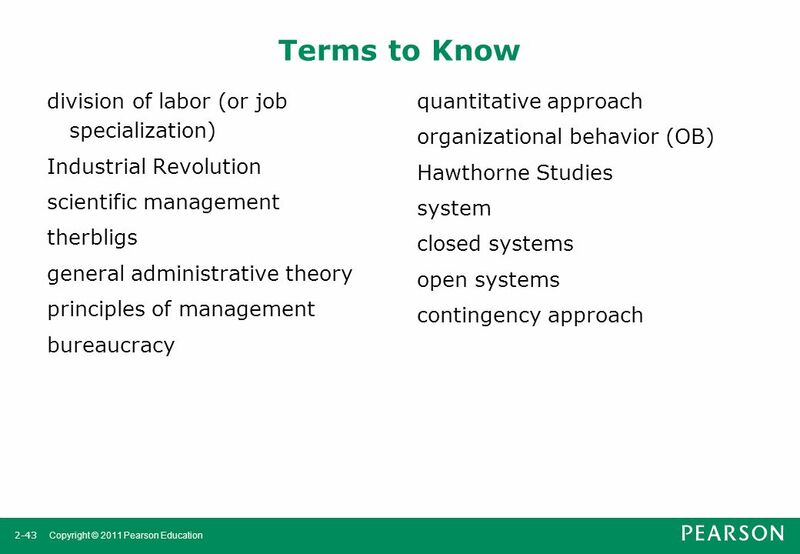 Explain the contributions of the Hawthorne Studies to the field of management. 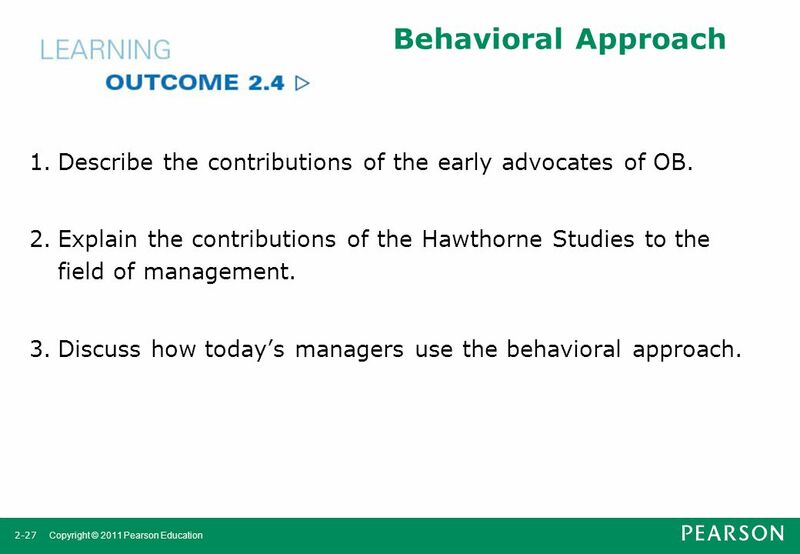 Discuss how today’s managers use the behavioral approach. 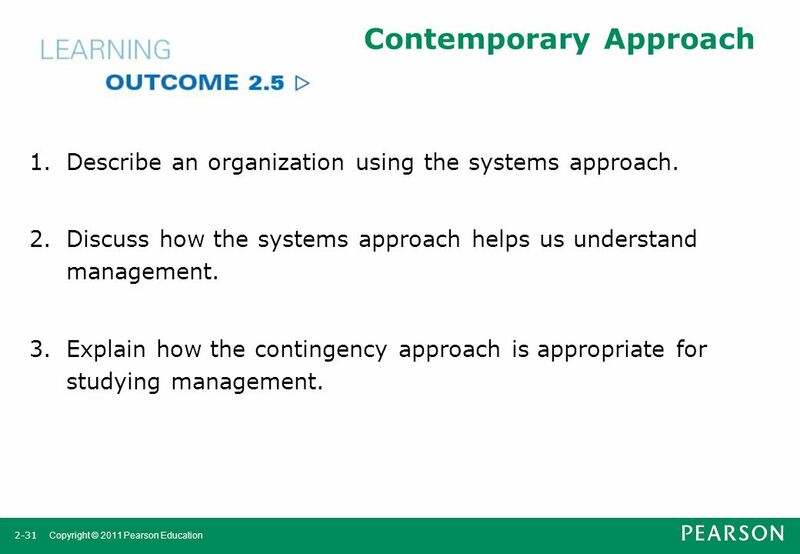 2.5 Contemporary Approach Describe an organization using the systems approach. 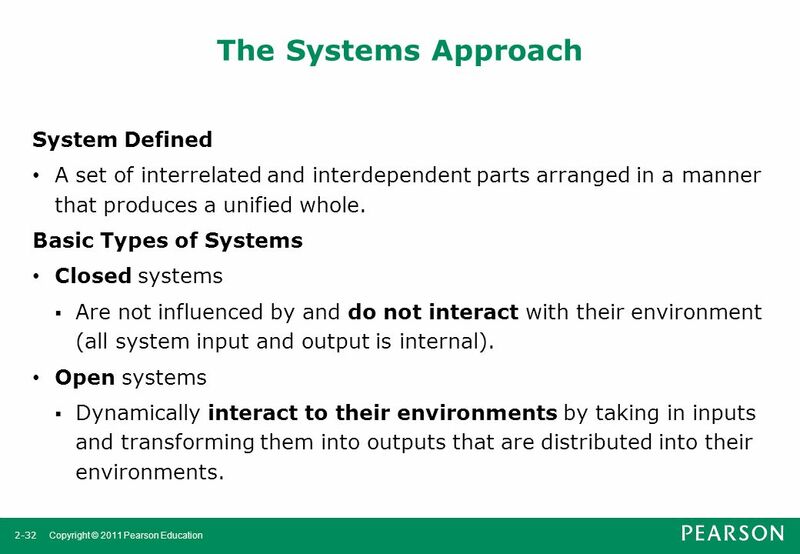 Discuss how the systems approach helps us understand management. Explain how the contingency approach is appropriate for studying management. 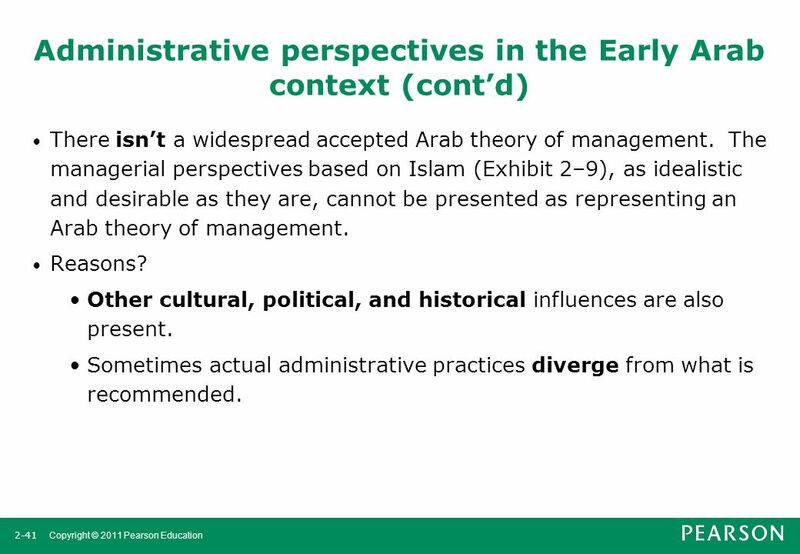 6 Learning Outcomes 2.6 Administrative Perspectives In The Early Arab Context Discuss managerial perspectives from an Islamic perspective. Explain which factors have impacted Arab managerial practice. Recognize the complexity of factors impacting Arab management thought and practice. Explain why studying management history is important. Describe some early evidences of management practice. 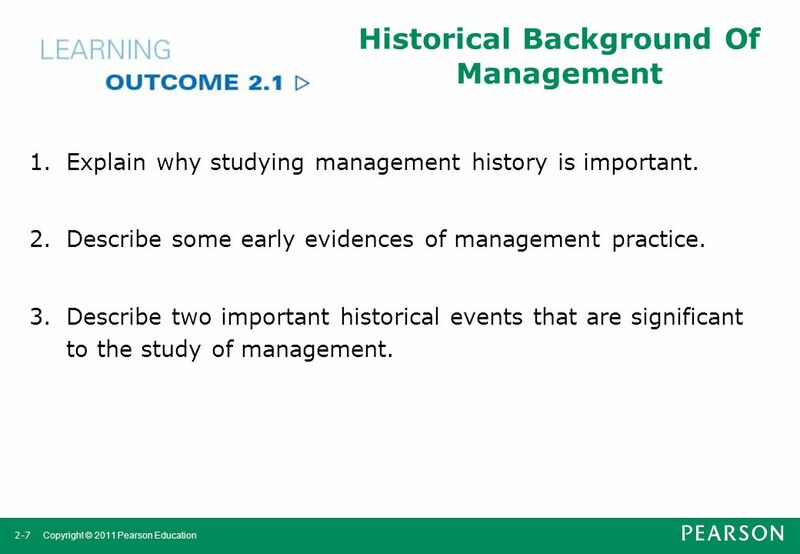 Describe two important historical events that are significant to the study of management. 11 Classical Approach Describe the important contributions made by Frederick W. Taylor and Frank and Lillian Gilbreth. 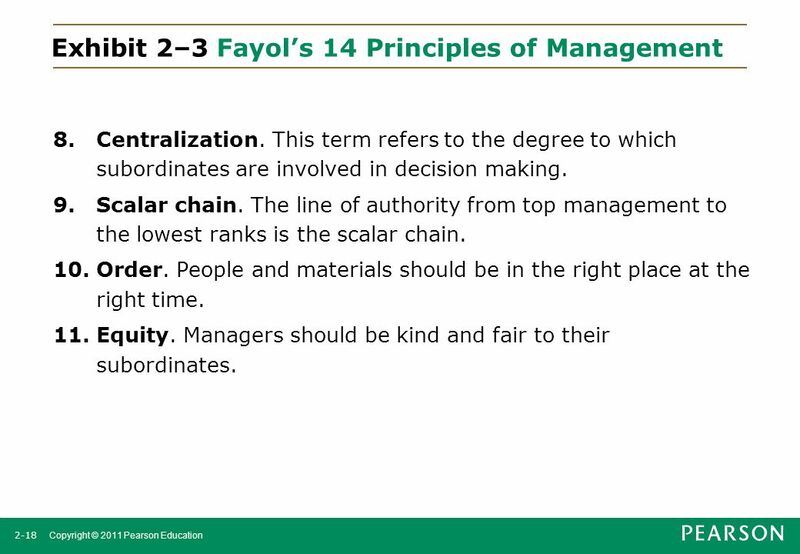 Discuss Fayol’s and Weber’s contributions to management theory. 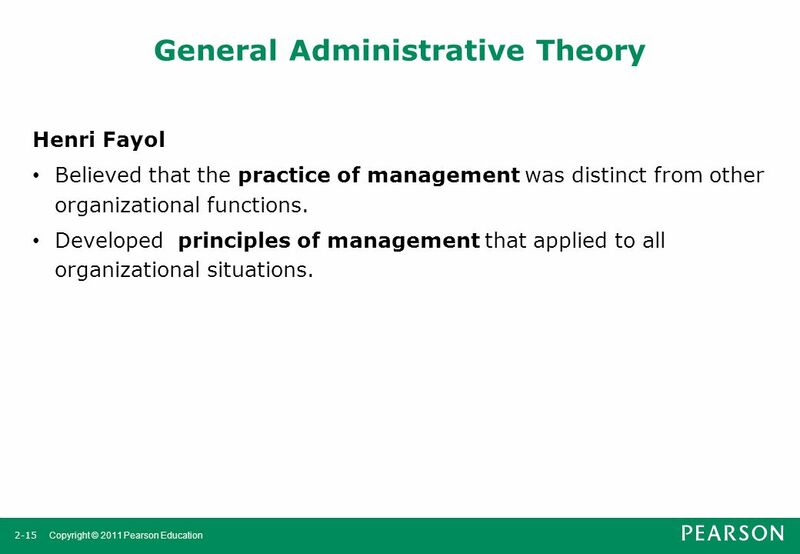 Explain how today’s managers use scientific management and general administrative theory. Fredrick Winslow Taylor The “father” of scientific management Published Principles of Scientific Management (1911) The theory of scientific management Using scientific methods to define the “one best way” for a job to be done: Putting the right person on the job with the correct tools and equipment. Having a standardized method of doing the job. Providing an economic incentive to the worker. 1. Develop a science for each element of an individual’s work, which will replace the old rule-of-thumb method. 2. 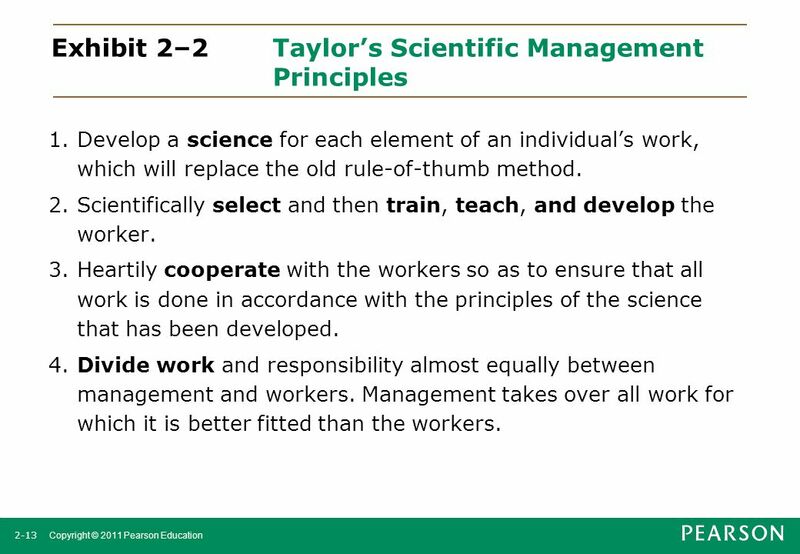 Scientifically select and then train, teach, and develop the worker. 3. Heartily cooperate with the workers so as to ensure that all work is done in accordance with the principles of the science that has been developed. 4. Divide work and responsibility almost equally between management and workers. Management takes over all work for which it is better fitted than the workers. 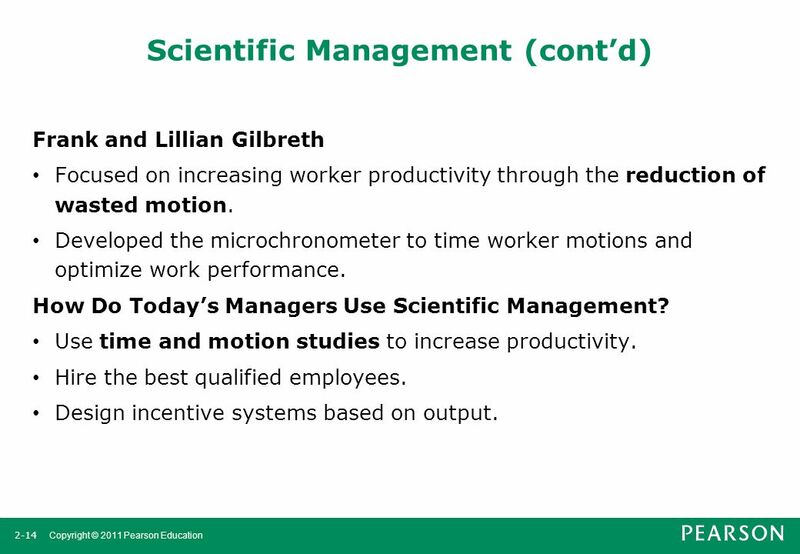 Frank and Lillian Gilbreth Focused on increasing worker productivity through the reduction of wasted motion. Developed the microchronometer to time worker motions and optimize work performance. 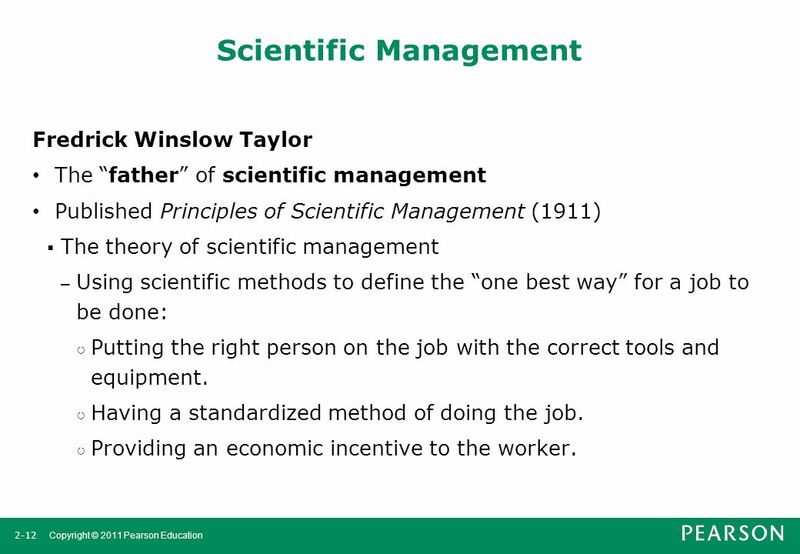 How Do Today’s Managers Use Scientific Management? Use time and motion studies to increase productivity. Hire the best qualified employees. Design incentive systems based on output. 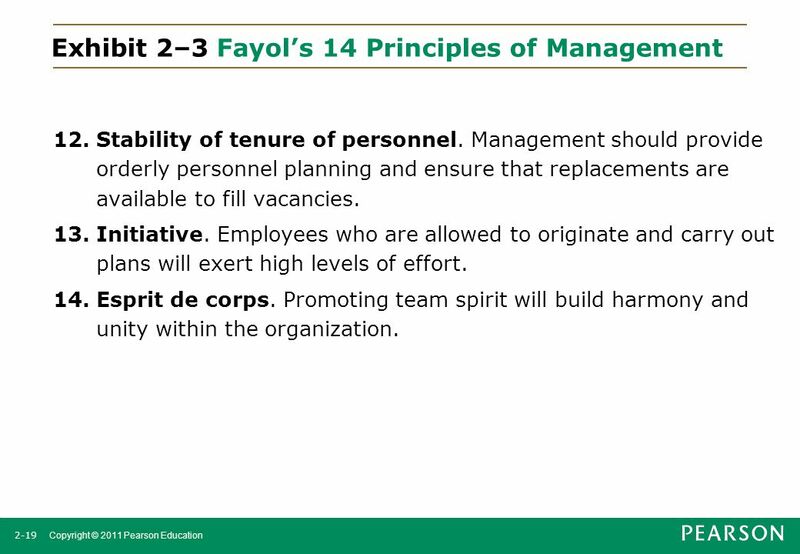 Henri Fayol Believed that the practice of management was distinct from other organizational functions. 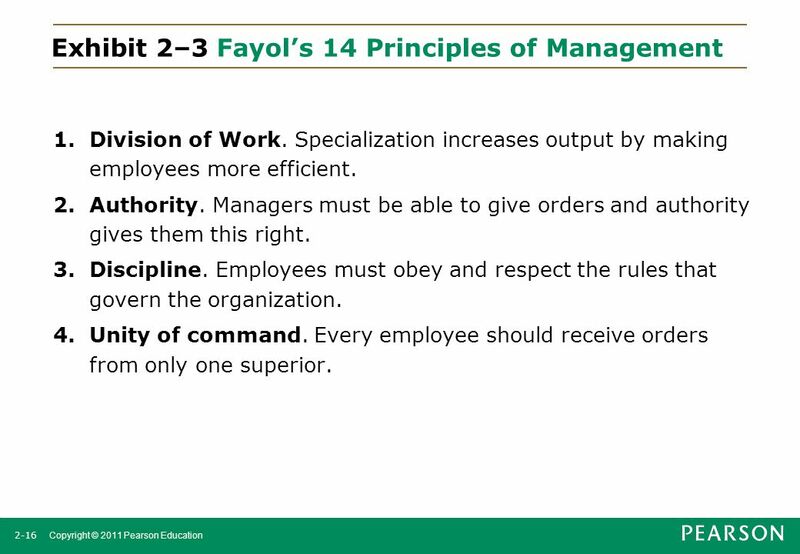 Developed principles of management that applied to all organizational situations. 1. Division of Work. Specialization increases output by making employees more efficient. 2. Authority. Managers must be able to give orders and authority gives them this right. 3. Discipline. Employees must obey and respect the rules that govern the organization. 4. Unity of command. Every employee should receive orders from only one superior. 5. Unity of direction. The organization should have a single plan of action to guide managers and workers. 6. Subordination of individual interests to the general interest. The interests of any one employee or group of employees should not take precedence over the interests of the organization as a whole. 7. Remuneration. Workers must be paid a fair wage for their services. 8. Centralization. This term refers to the degree to which subordinates are involved in decision making. 9. Scalar chain. The line of authority from top management to the lowest ranks is the scalar chain. 10. Order. People and materials should be in the right place at the right time. 11. Equity. Managers should be kind and fair to their subordinates. 12. Stability of tenure of personnel. Management should provide orderly personnel planning and ensure that replacements are available to fill vacancies. 13. Initiative. Employees who are allowed to originate and carry out plans will exert high levels of effort. 14. Esprit de corps. Promoting team spirit will build harmony and unity within the organization. 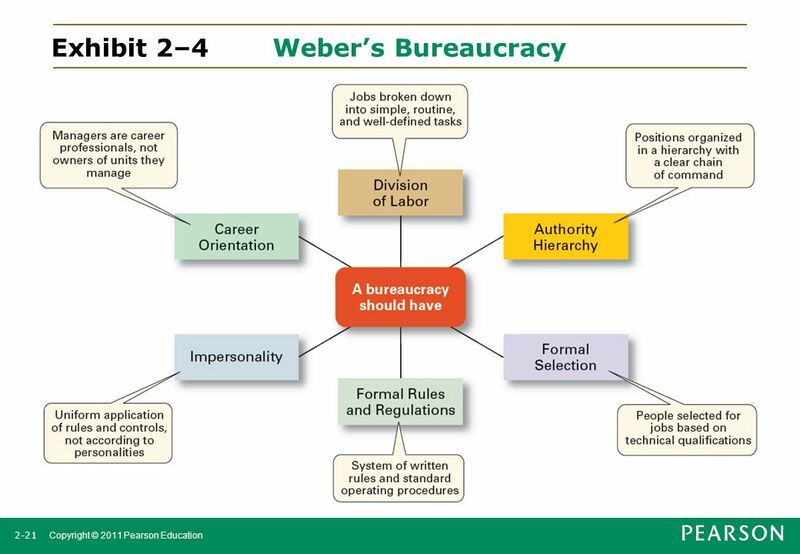 Max Weber Developed a theory of authority based on an ideal type of organization (bureaucracy). Emphasized rationality, predictability, impersonality, technical competence, and authoritarianism. 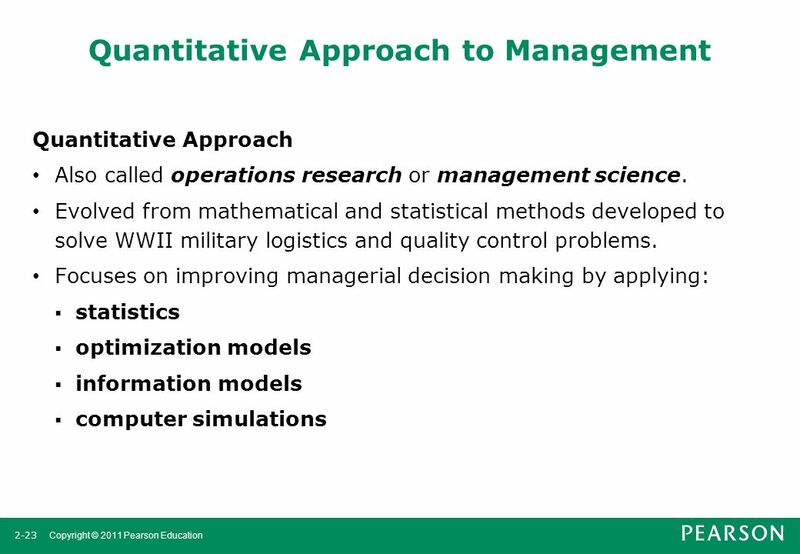 Explain what the quantitative approach has contributed to the field of management. Describe total quality management. 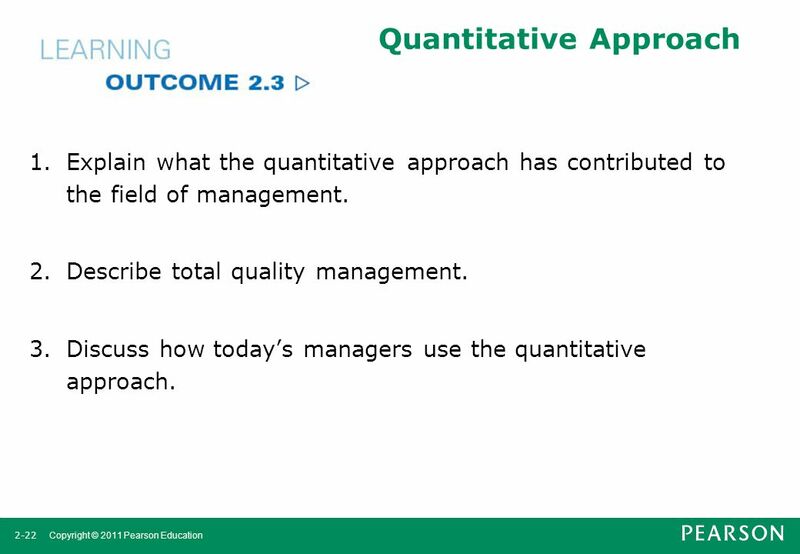 Discuss how today’s managers use the quantitative approach. 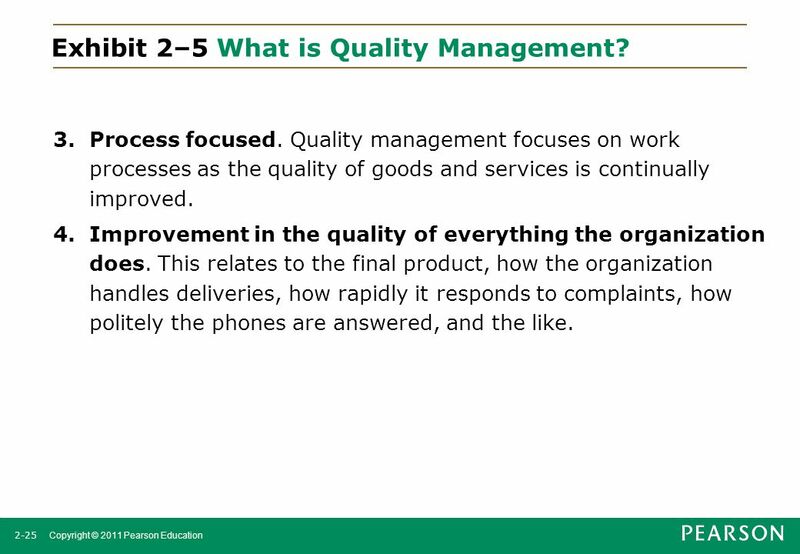 24 Exhibit 2–5 What is Quality Management? 1. Intense focus on the customer. The customer includes outsiders who buy the organization’s products or services and internal customers who interact with and serve others in the organization. 2. Concern for continual improvement. Quality management is a commitment to never being satisfied. “Very good” is not good enough. Quality can always be improved. 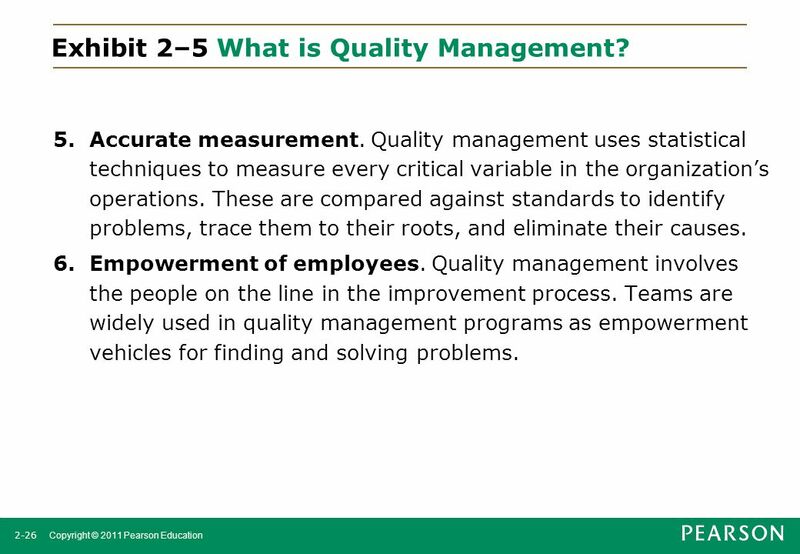 25 Exhibit 2–5 What is Quality Management? 3. Process focused. Quality management focuses on work processes as the quality of goods and services is continually improved. 4. Improvement in the quality of everything the organization does. This relates to the final product, how the organization handles deliveries, how rapidly it responds to complaints, how politely the phones are answered, and the like. 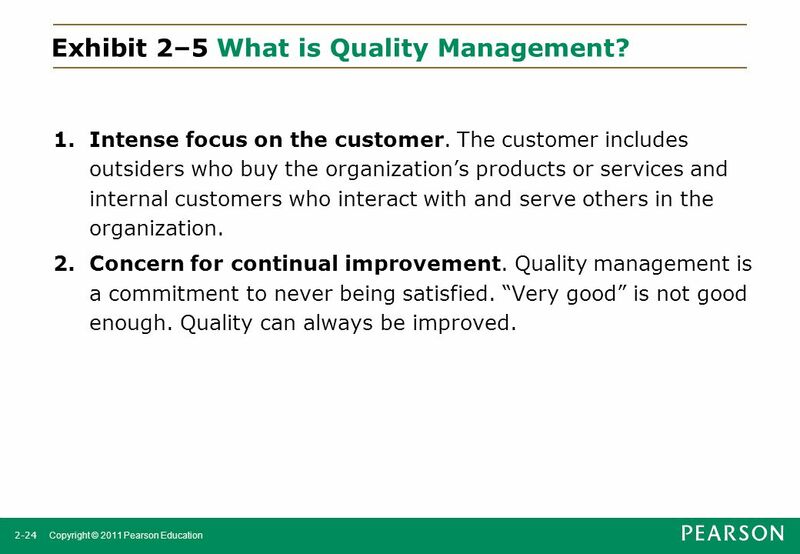 26 Exhibit 2–5 What is Quality Management? 5. Accurate measurement. Quality management uses statistical techniques to measure every critical variable in the organization’s operations. These are compared against standards to identify problems, trace them to their roots, and eliminate their causes. 6. Empowerment of employees. Quality management involves the people on the line in the improvement process. Teams are widely used in quality management programs as empowerment vehicles for finding and solving problems. 27 Behavioral Approach 1. Describe the contributions of the early advocates of OB. 2. 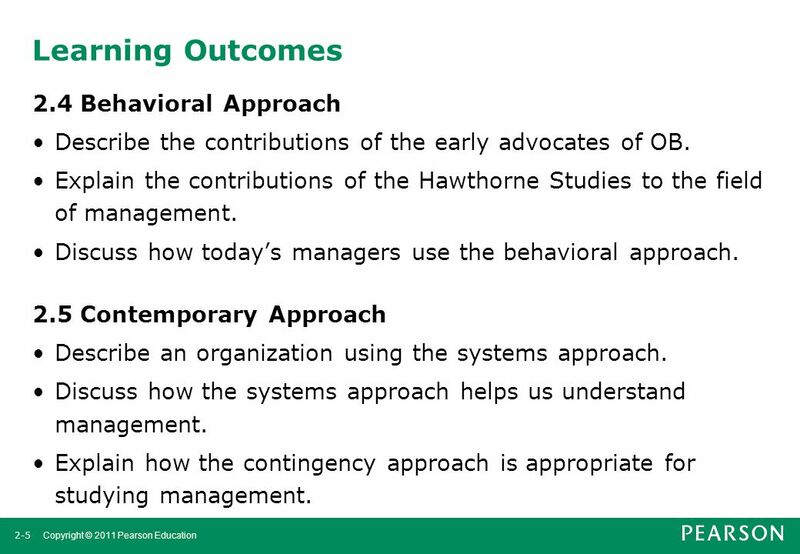 Explain the contributions of the Hawthorne Studies to the field of management. 3. 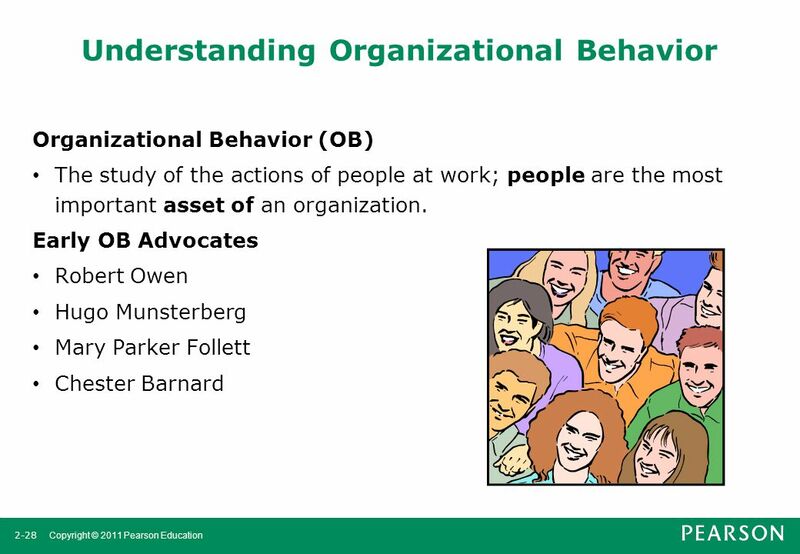 Discuss how today’s managers use the behavioral approach. 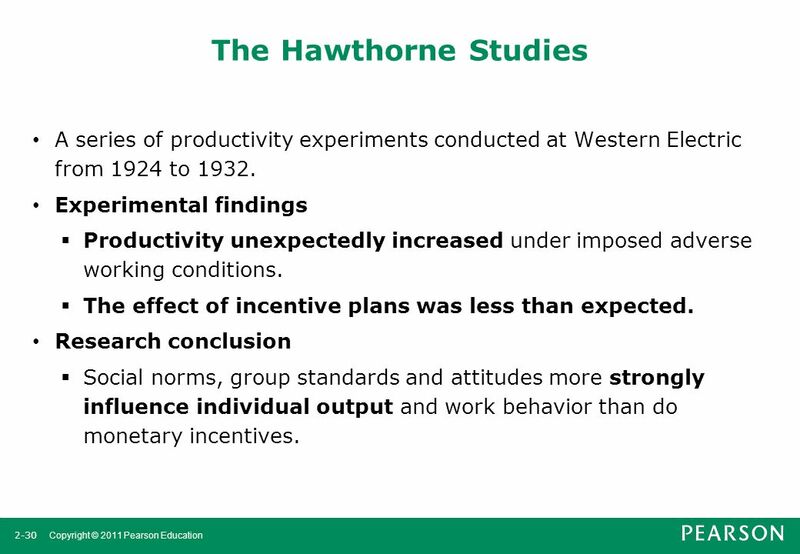 30 The Hawthorne Studies A series of productivity experiments conducted at Western Electric from 1924 to 1932. Experimental findings Productivity unexpectedly increased under imposed adverse working conditions. The effect of incentive plans was less than expected. Research conclusion Social norms, group standards and attitudes more strongly influence individual output and work behavior than do monetary incentives. 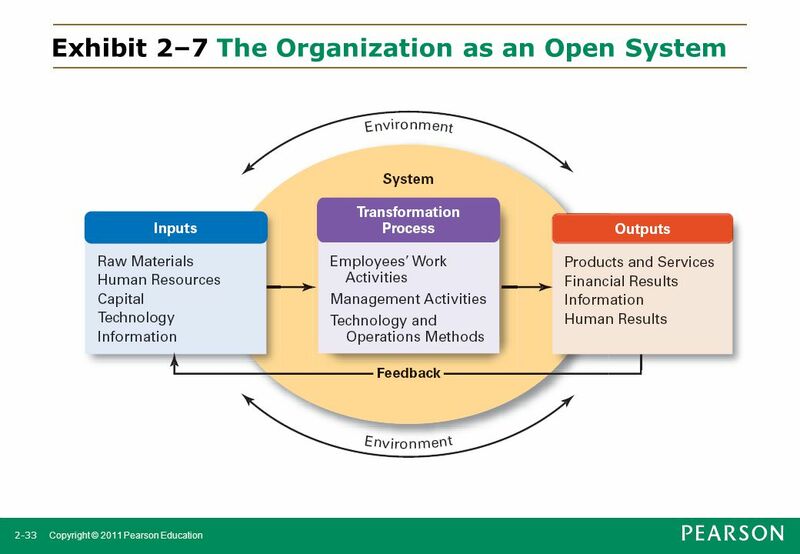 Describe an organization using the systems approach. Discuss how the systems approach helps us understand management. 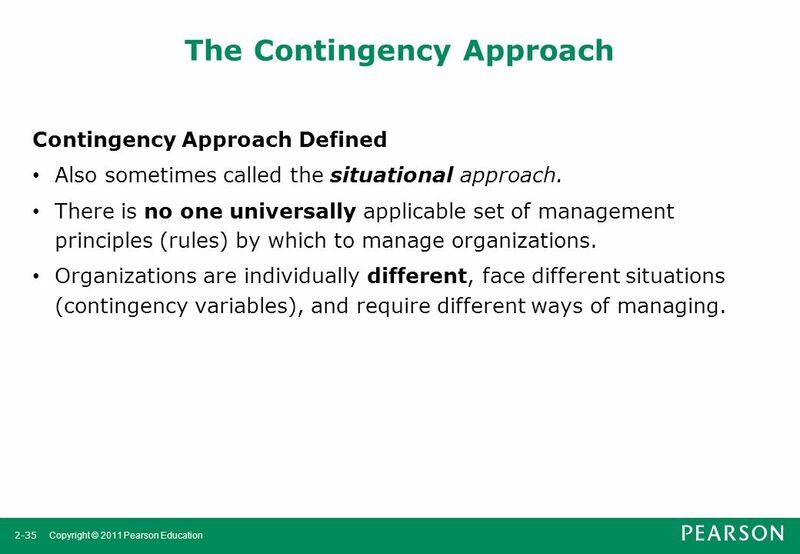 Explain how the contingency approach is appropriate for studying management. A set of interrelated and interdependent parts arranged in a manner that produces a unified whole. Basic Types of Systems Closed systems Are not influenced by and do not interact with their environment (all system input and output is internal). Open systems Dynamically interact to their environments by taking in inputs and transforming them into outputs that are distributed into their environments. Coordination of the organization’s parts is essential for proper functioning of the entire organization. Decisions and actions taken in one area of the organization will have an effect in other areas of the organization. Organizations are not self-contained and, therefore, must adapt to changes in their external environment. 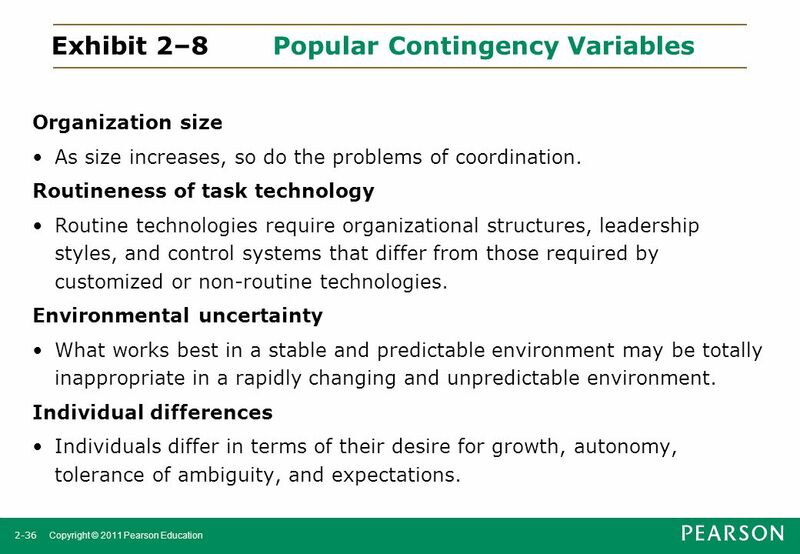 Contingency Approach Defined Also sometimes called the situational approach. There is no one universally applicable set of management principles (rules) by which to manage organizations. Organizations are individually different, face different situations (contingency variables), and require different ways of managing. Organization size As size increases, so do the problems of coordination. Routineness of task technology Routine technologies require organizational structures, leadership styles, and control systems that differ from those required by customized or non-routine technologies. Environmental uncertainty What works best in a stable and predictable environment may be totally inappropriate in a rapidly changing and unpredictable environment. Individual differences Individuals differ in terms of their desire for growth, autonomy, tolerance of ambiguity, and expectations. Discuss managerial perspectives from an Islamic perspective. Explain which factors have impacted Arab managerial practice. 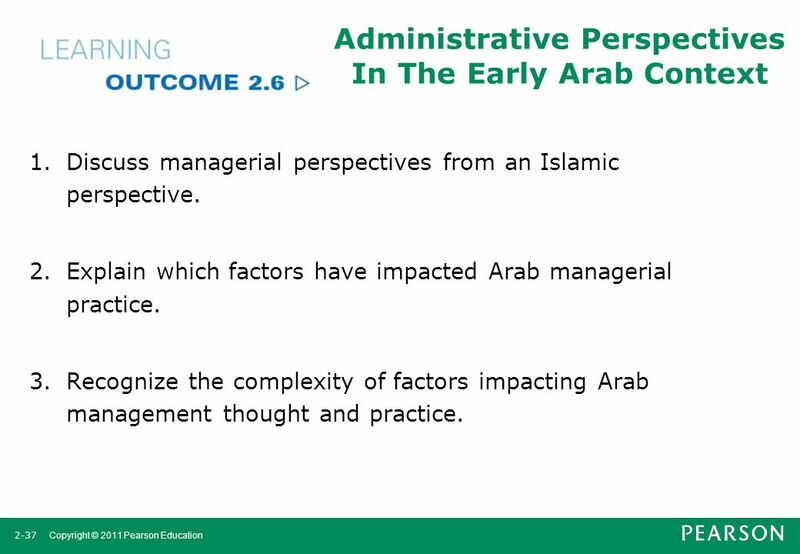 Recognize the complexity of factors impacting Arab management thought and practice. Early Arabs lived in relatively small communities. Tribal life and work within the Bedouin environment emphasized the role of endurance, generosity, and communal cohesion, but this did not necessitate any type of advanced managerial thinking. The relationship between the employer and the employee was simple and issues of fairness and equality were not a priority at the time. With the advent of Islam in the year 622 C.E., attitudes towards certain professions were drastically changed. Prophet Muhammad (PBUH) developed a perspective of work and management that was radically different from the earlier perspectives. The relationship between the employer and the employee changed. Under the new paradigm, the employee was supposed to get his fair share quickly. There isn’t a widespread accepted Arab theory of management. 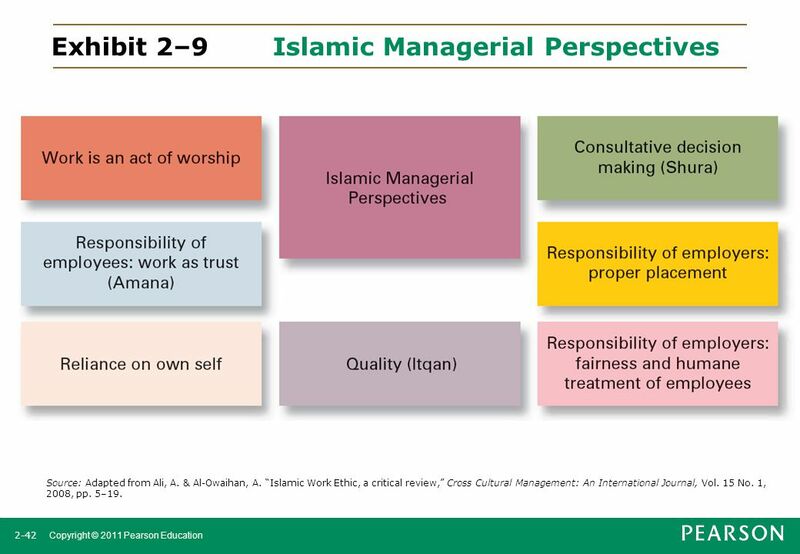 The managerial perspectives based on Islam (Exhibit 2–9), as idealistic and desirable as they are, cannot be presented as representing an Arab theory of management. Reasons? Other cultural, political, and historical influences are also present. Sometimes actual administrative practices diverge from what is recommended. Source: Adapted from Ali, A. & Al-Owaihan, A. “Islamic Work Ethic, a critical review,” Cross Cultural Management: An International Journal, Vol. 15 No. 1, 2008, pp. 5–19. 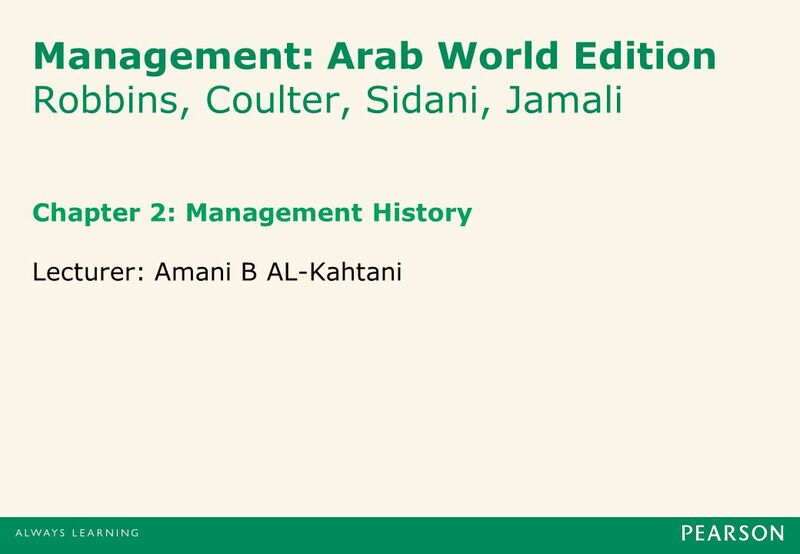 Download ppt "Management: Arab World Edition Robbins, Coulter, Sidani, Jamali"
Chapter 2 Copyright ©2007 by South-Western, a division of Thomson Learning. All rights reserved Why We Need Managers Today 1 Work in families Skilled laborers. ACCA – F1 Lesson One Part I. POP QUIZ Adam Smith realized that production was being done in one of two ways. What were those? Frederick Taylor said there were 4 principles to the.